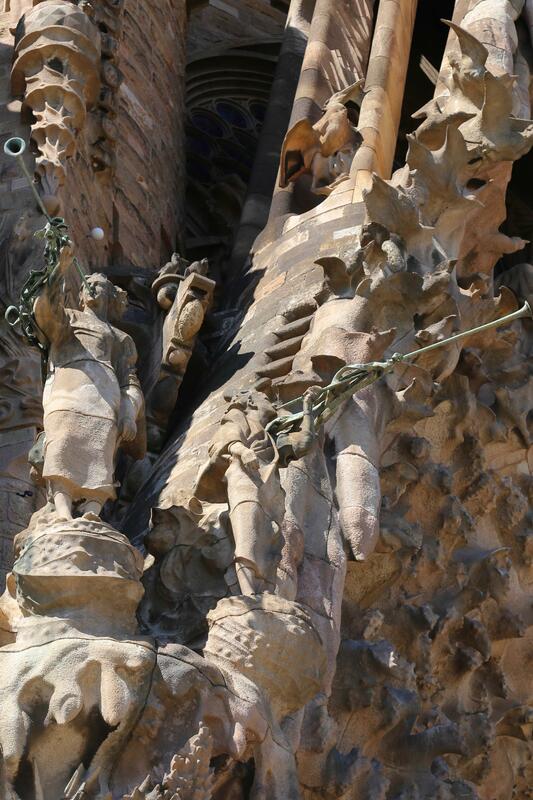 For well over a century work has been underway at Sagrada Familia to complete the dream of one man’s incredible vision. 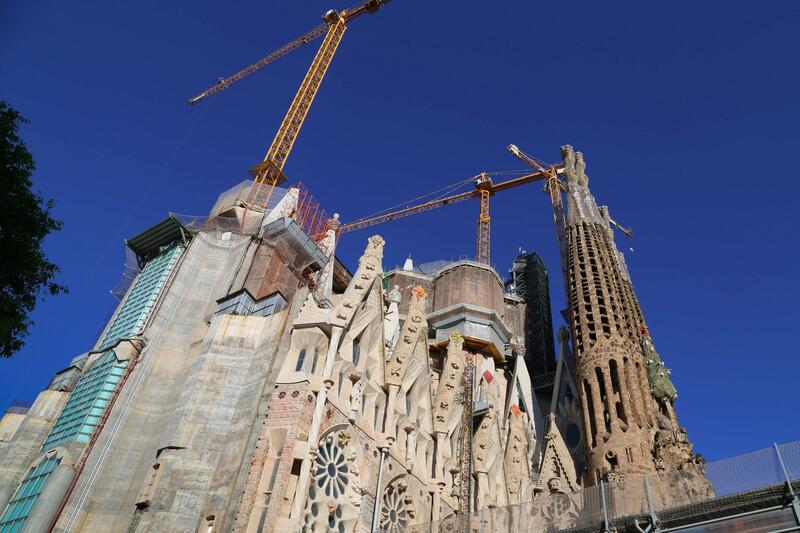 Work at the famed basilica has been underway since the cornerstone was laid in 1882. Officials expect work to complete by 2026. 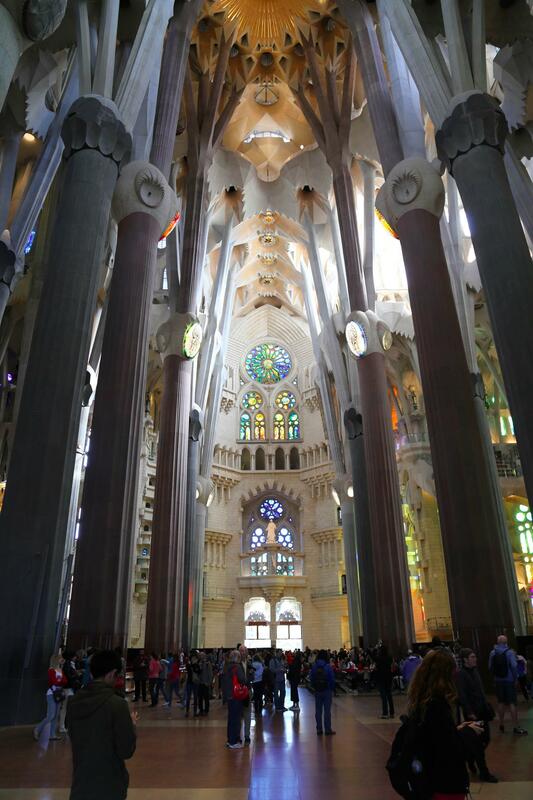 It is difficult to grasp the complexity of the design and engineering of Sagrada Familia, and then to realize that all of this was spearheaded by one person — Antoni Gaudi. 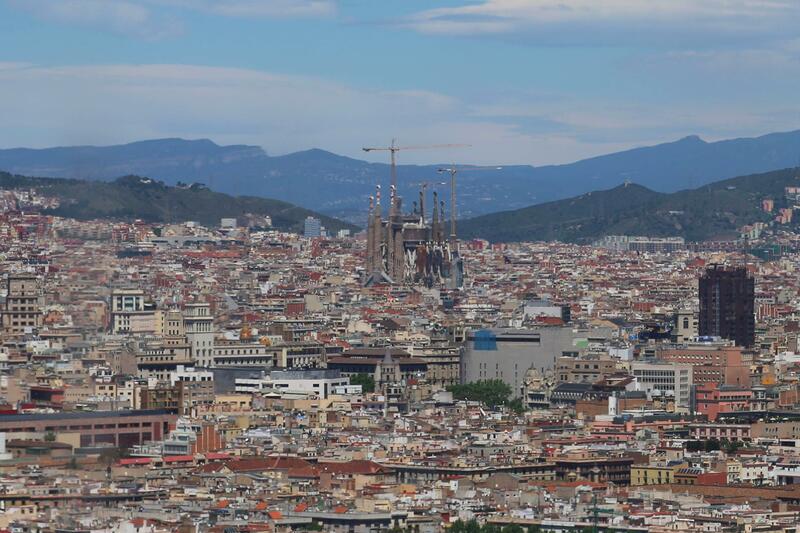 A view of Barcelona from inside one of the church spires. 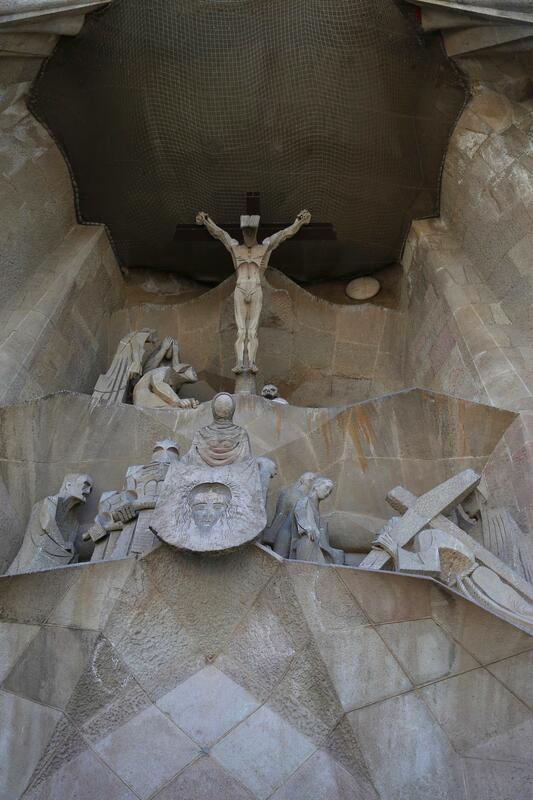 The Passion Facade above the west entryway of the basilica was envisioned by Gaudi but executed by Josep Maria Subirachs beginning in 1986. 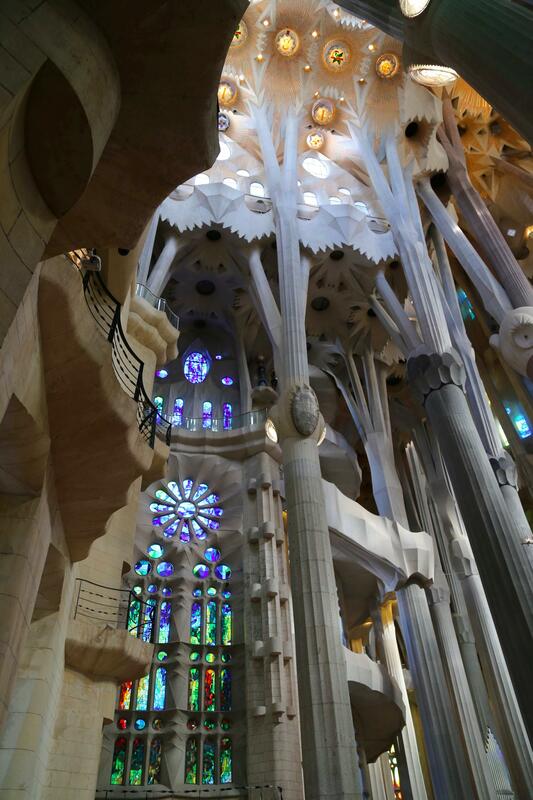 The austere and sharp angles of the pieces are faithful to Gaudi’s design that is intended to invoke fear. 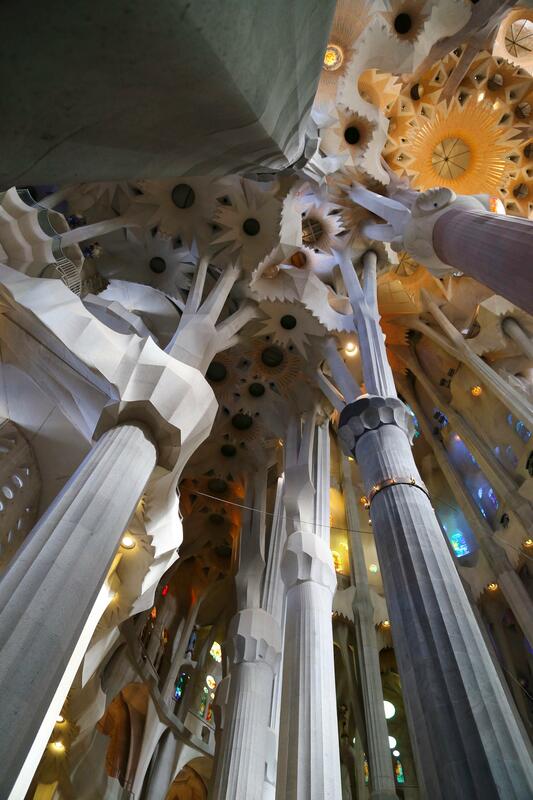 Shapes and elements of all sorts have a way of blending together in the design of Antoni Gaudi’s creation. 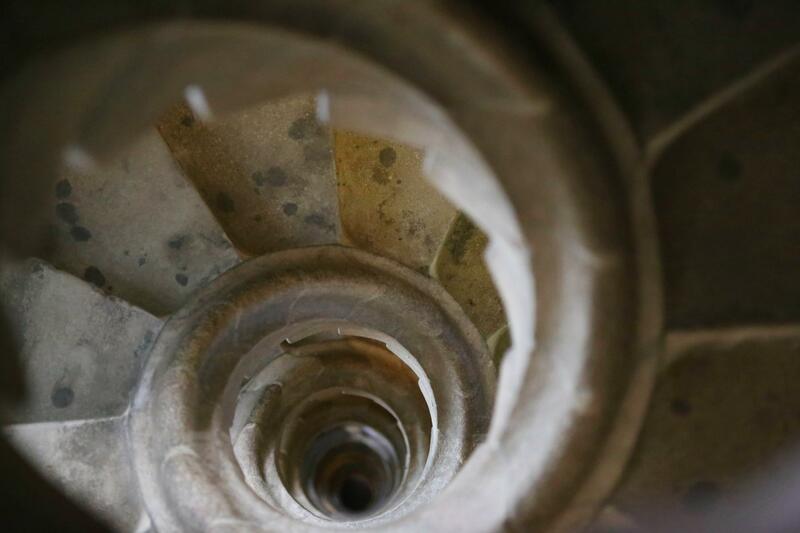 The well worn spiral staircase descending one of the spires might easily be a metaphor for the twisting path that was Antoni Gaudi’s life and the world famous basilica he envisioned. 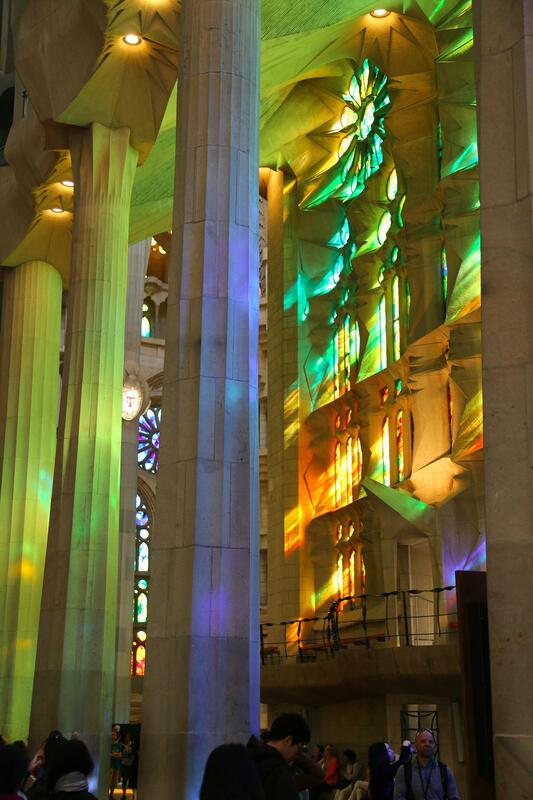 Windows from the more modern visitors center and gift shop reflect some of the facade of Sagradia Familia. 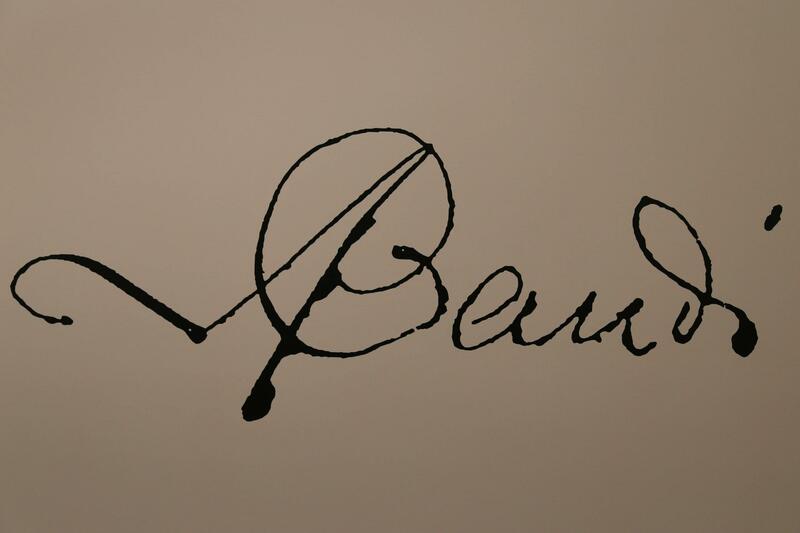 Gaudi’s signature shows boldness and hesitation, but clearly proclaims the name of one of the world’s great architects. 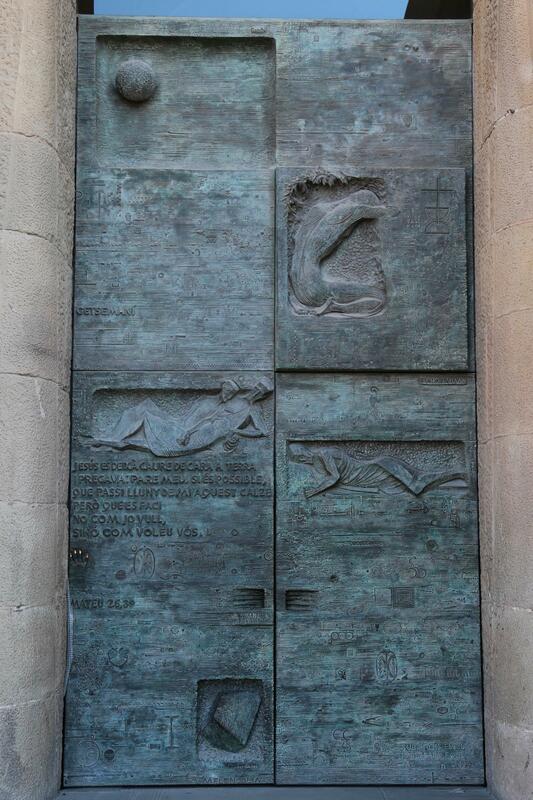 One of the doorways at Sagrada Familia is filled with biblical references. 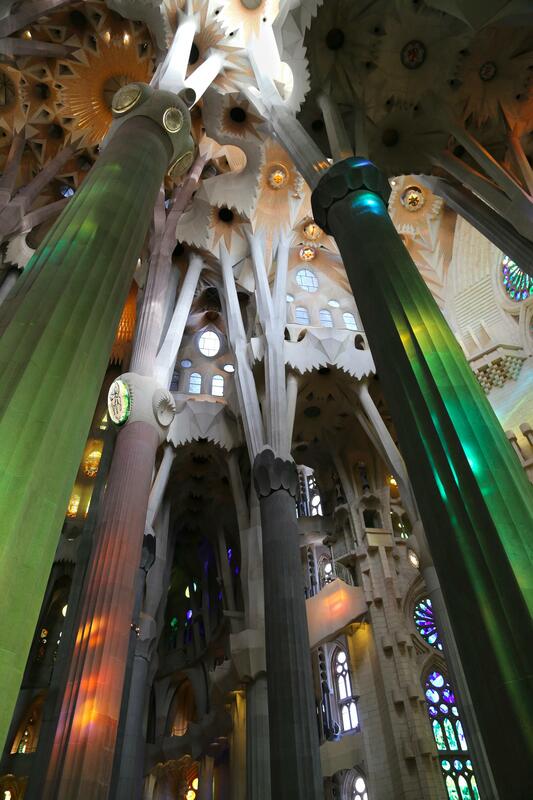 There is a lot to see and take in during a visit to Sagrada Familia because everywhere you turn you see something as beautiful as this. 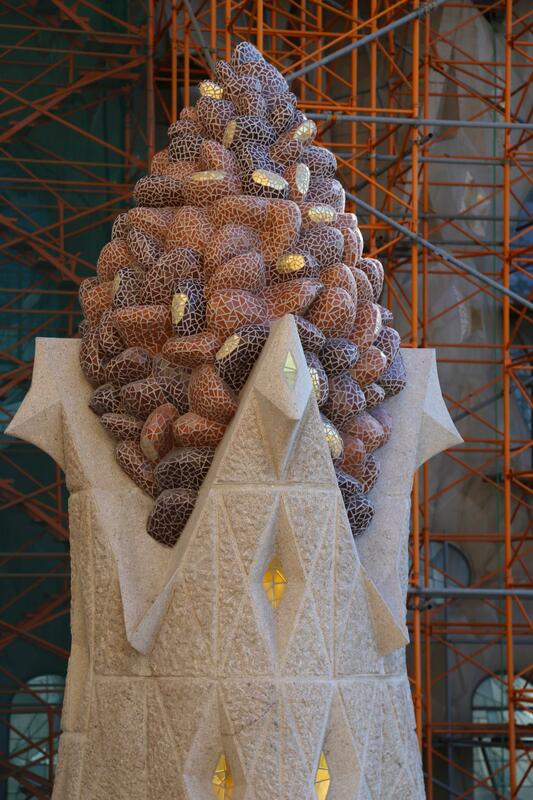 Trumpets blare in this small detail of the Nativity Facade on the east side of Sagrada Familia. 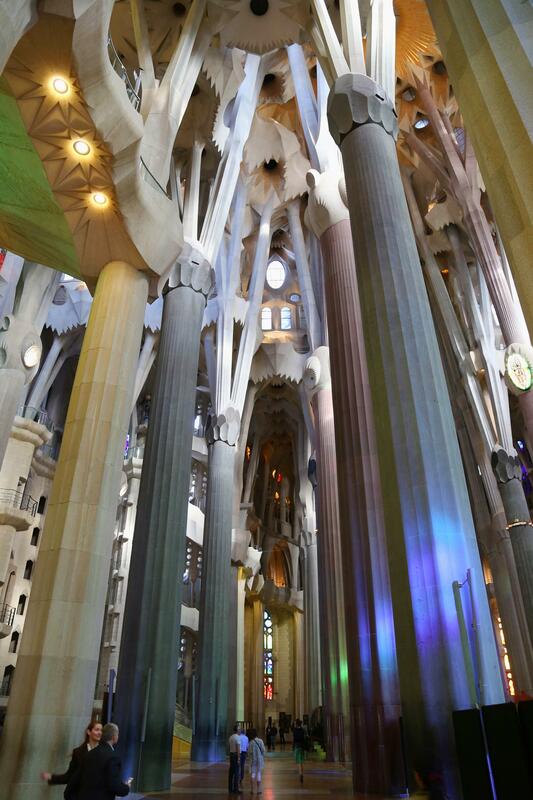 Antoni Gaudi had a deep love of nature and the columns inside Sagrada Familia are meant to be like the trees in a forest. 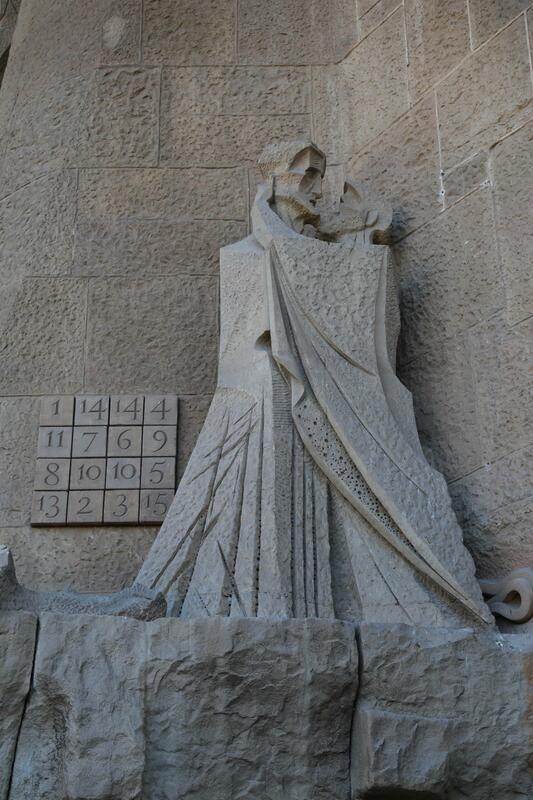 The cryptogram at this facade shows Gaudi’s creativity and devotion. Add any row of numbers in a straight line and you get the same answer — 33 — the age when Jesus Christ was crucified. 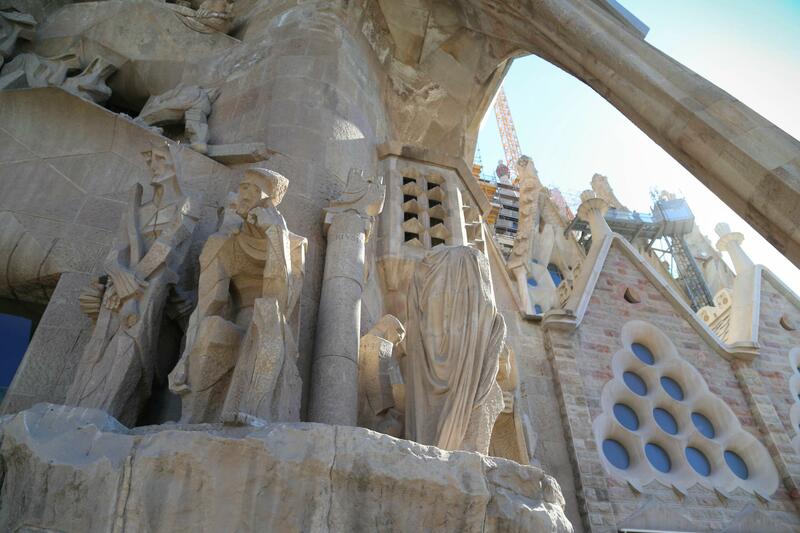 The Passion Facade, constructed years after Gaudi died, reflect a more angular and starker portrayal of stories from the Bible. 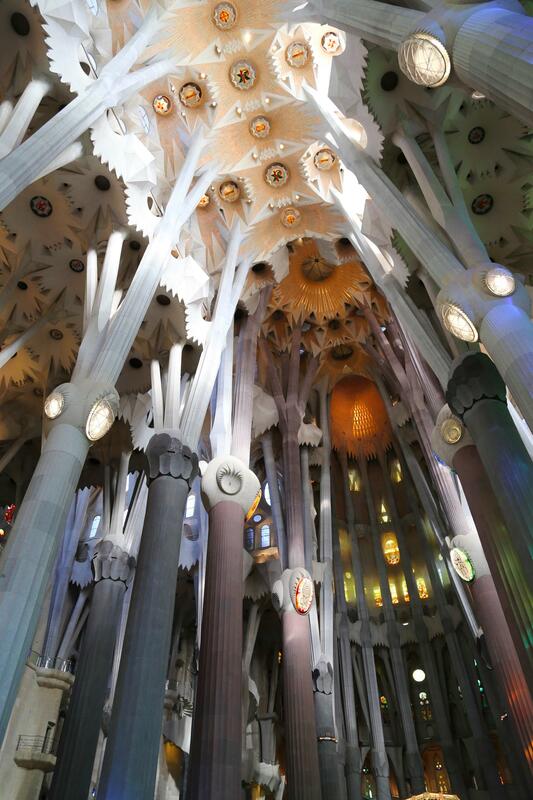 This is an excellent example of Gaudi’s use of engineering and aesthetics to produce strength, volume, beauty, and harmony. 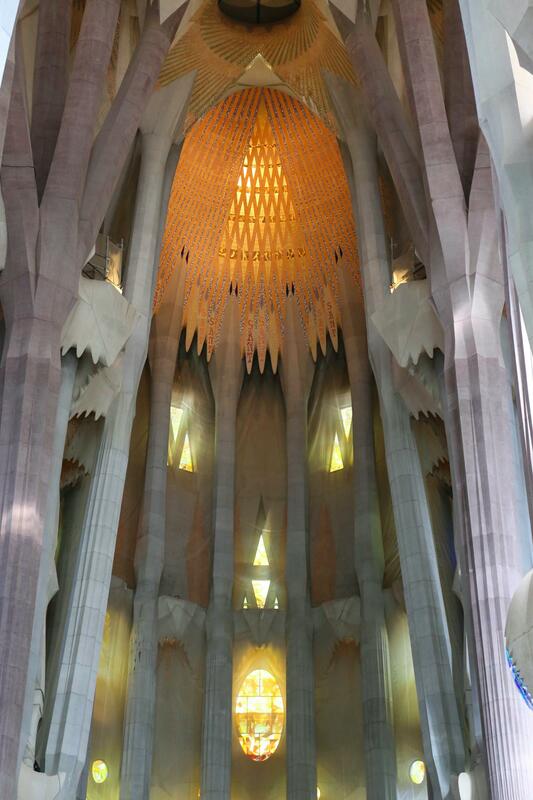 The tapered spires outside Sagrada Familia are hollow, with openings to light the way. 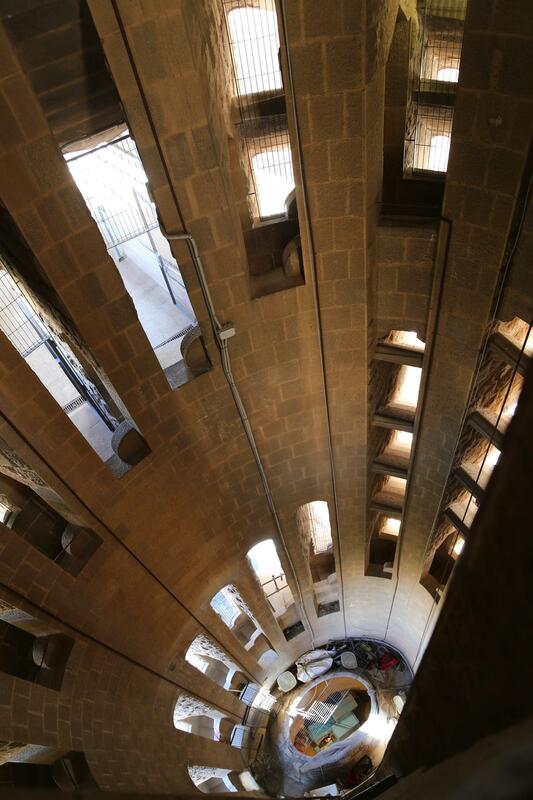 Until an elevator was installed a few years back, visitors had to be in good shape to walk up these stairs before they could go down. 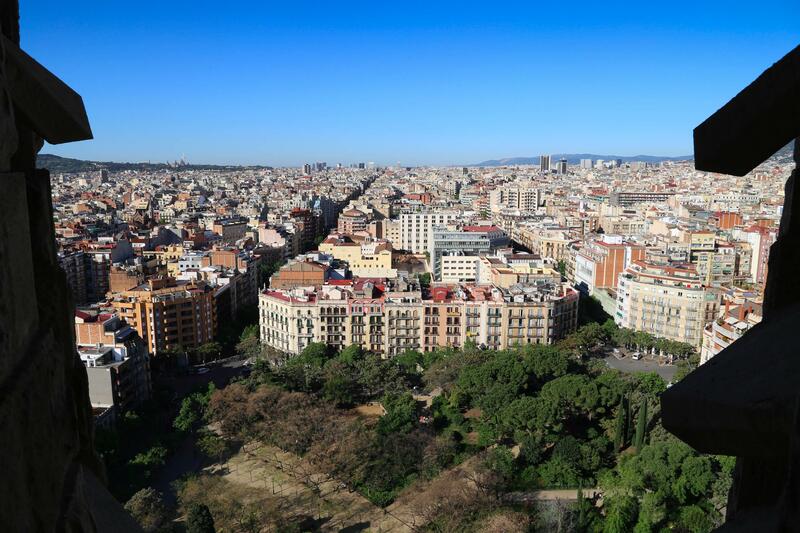 But the views to the city make the journey — and slightly added expense — worth it. From inside the spire one can catch a glimpse of an element looking down at the scaffolding used by construction workers. 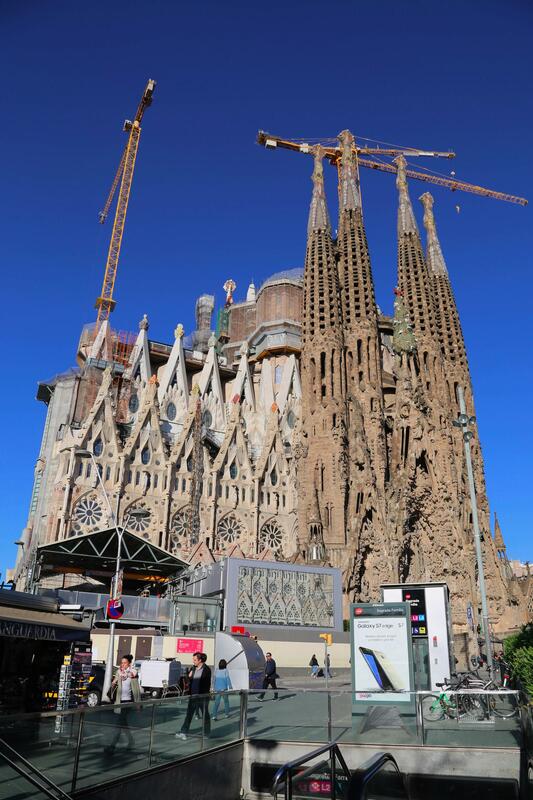 Sagrada Familia is an integral part of Barcelona, one of the world’s great cities. 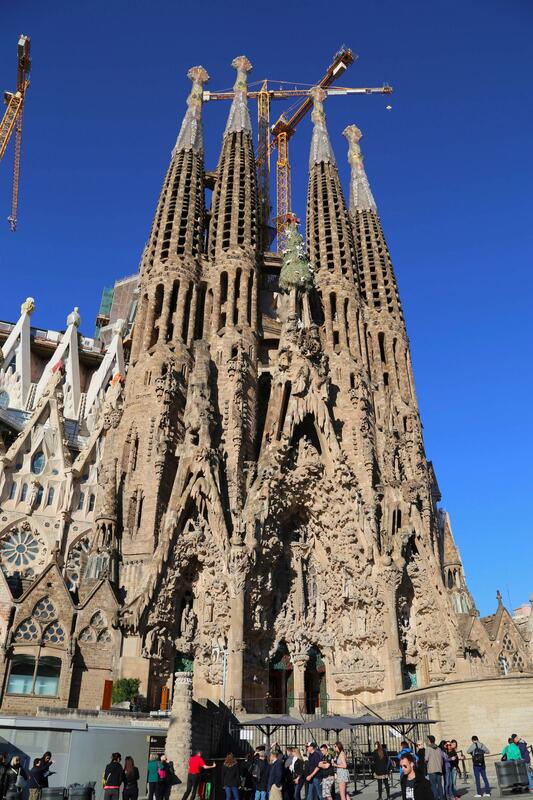 When Gaudi was named chief architect of Sagrada Familia in 1883, he discarded the notion of a Neo-Gothic design and created this design based on the notions of Modernisme. As sunlight passes through green stained glass and washes over the columns one gets the sense of standing among trees in a forest. 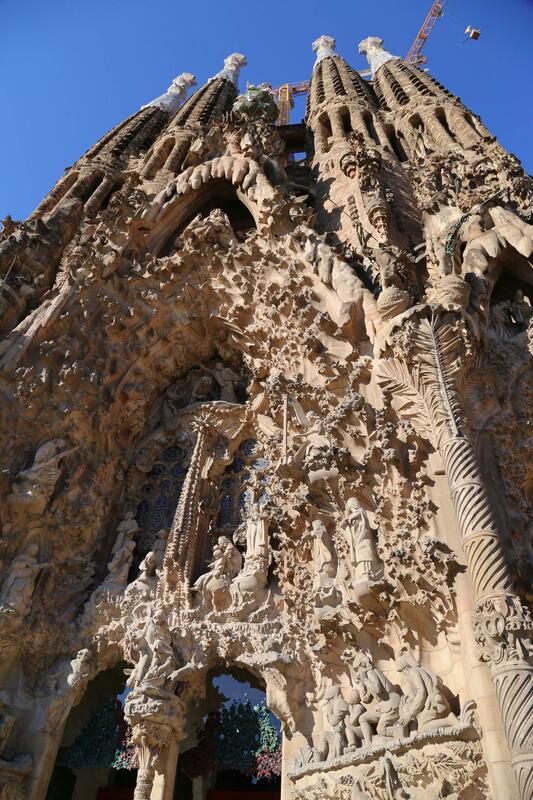 The Nativity Facade on the east side of the basilica depicts stories from the bible. 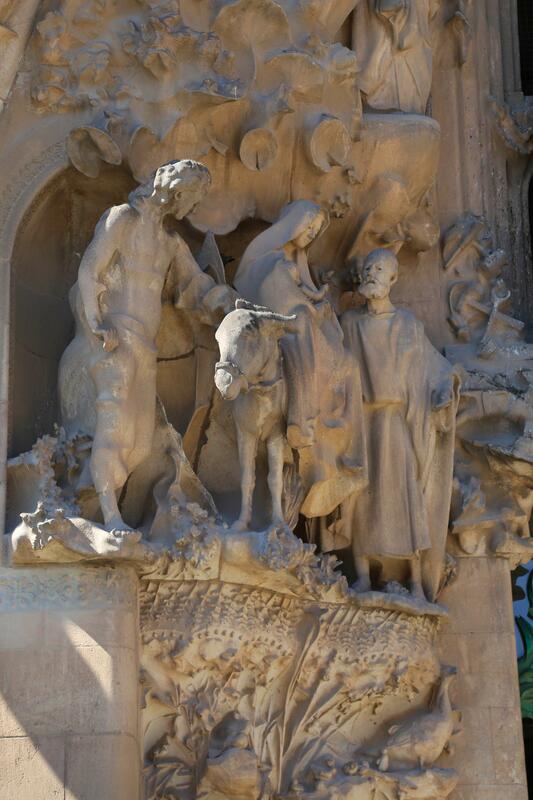 Mary, sitting upon a donkey while cradling her newborn son, Jesus, is accompanied by Joseph, on one part of the Nativity Facade at Sagrada Familia. 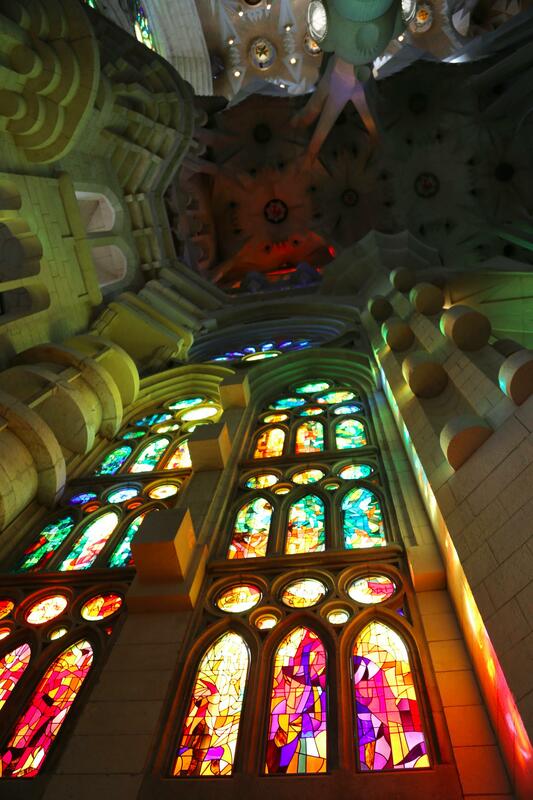 Depending on the time of day the stained glass windows at Sagrada Familia are either dazzling or subdued. 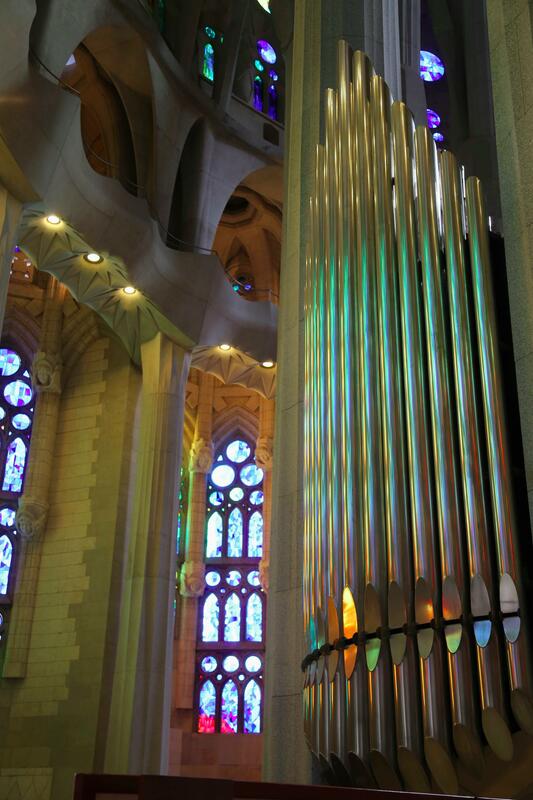 Light from stained glass windows dances across the pipes of the organ inside the basilica. 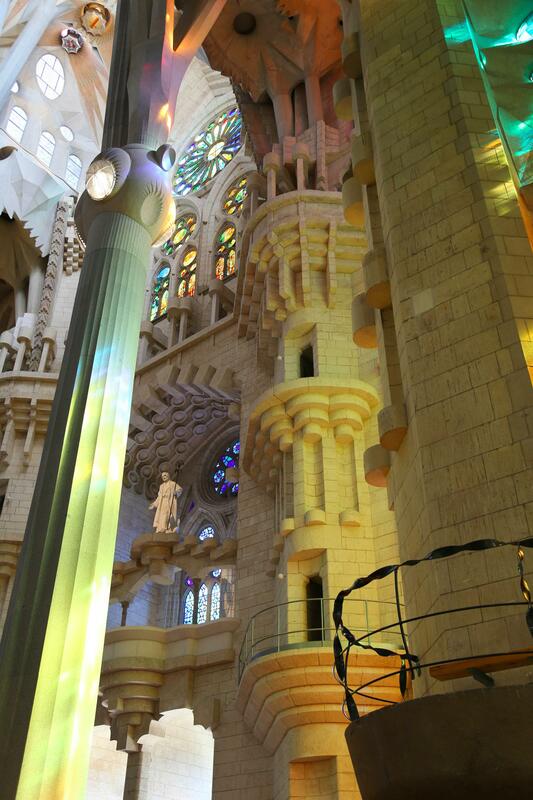 Everywhere inside the basilica is a montage of light and color, thanks to the huge stained glass windows that Gaudi designed. 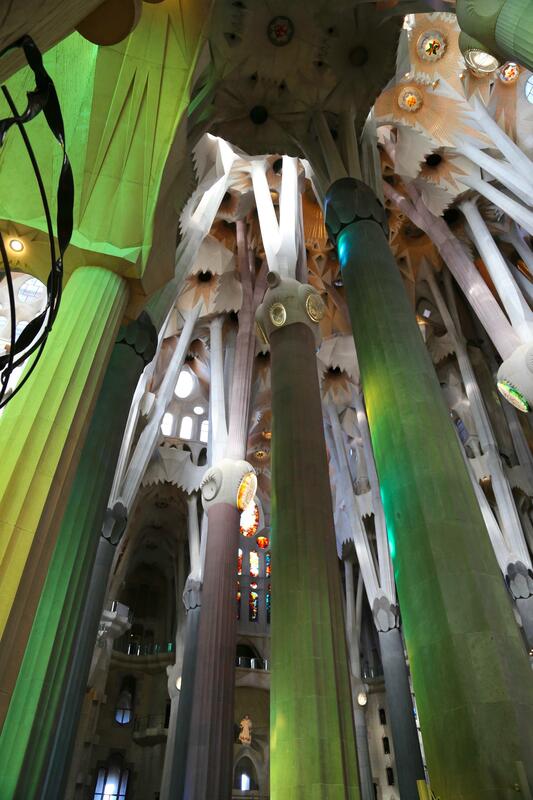 Gaudi’s multifurcation of columns was inspired by nature, like limbs spreading from a tree trunk that soar ever higher. 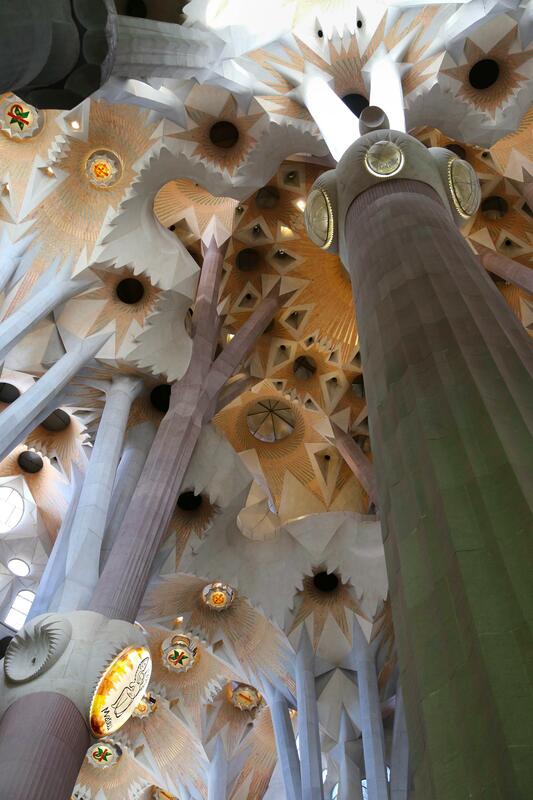 As the columns branch, lean, and reach, the design supports the roof, while preserving the soaring space of the church. The elements at the top of the column are meant to replicate a knot in a tree where limbs have fallen off and branches bifurcate as the tree grows higher. Note the ever-gentle twist in the column design, allowing for slender yet sturdy support. 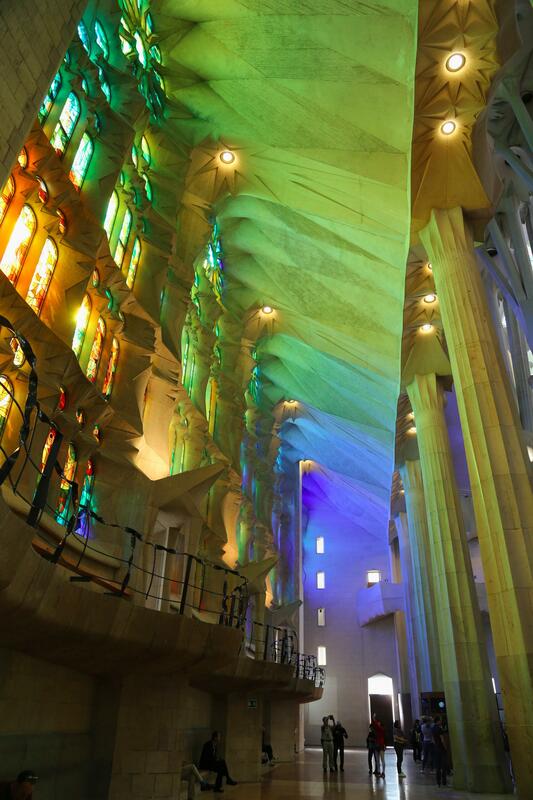 A wash of color in a rainbow of hues fills this space inside Sagrada Familia. As the sun changes position the space is illuminated with a new palette. 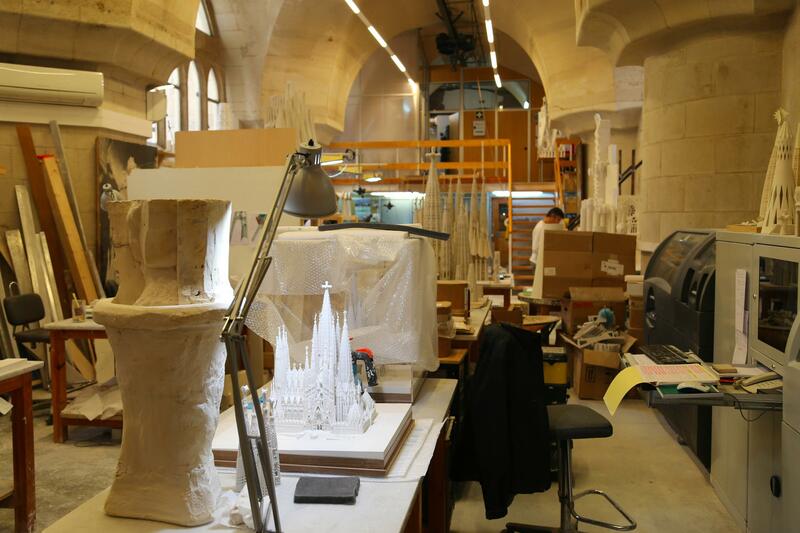 This workshop is essential for the designers, engineers and workers who labor to replicate Antoni Gaudi’s grand vision. 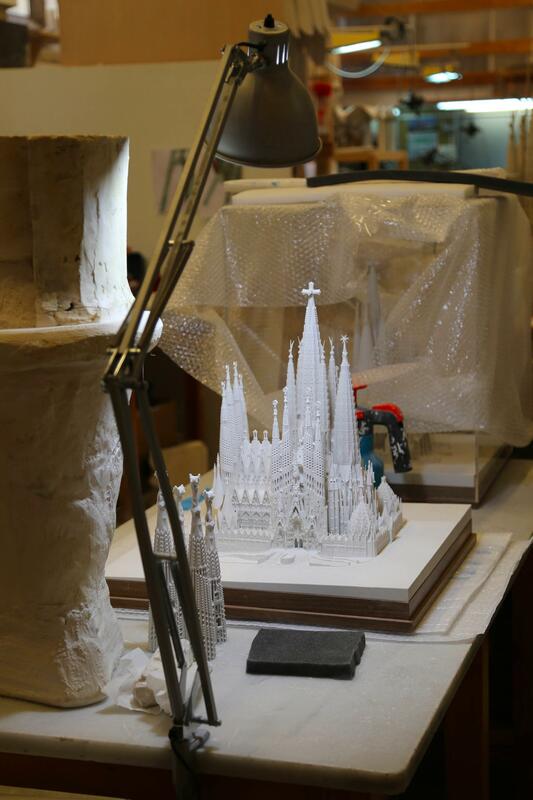 Though reduced in scale, this model of the Sagrada Familia holds many challenges for the dedicated team working to complete the project. 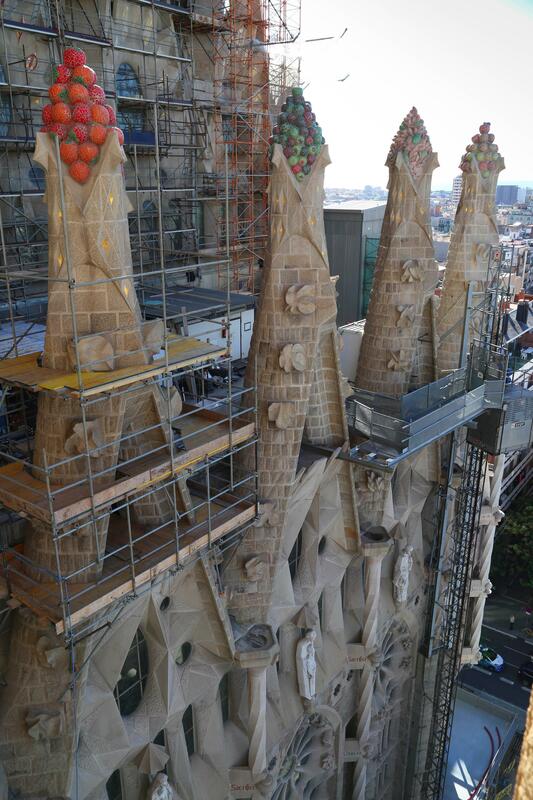 The Gloria Facade, on the south side is being built in accordance with Gaudi’s vision. When completed it will be the main entryway to the church. 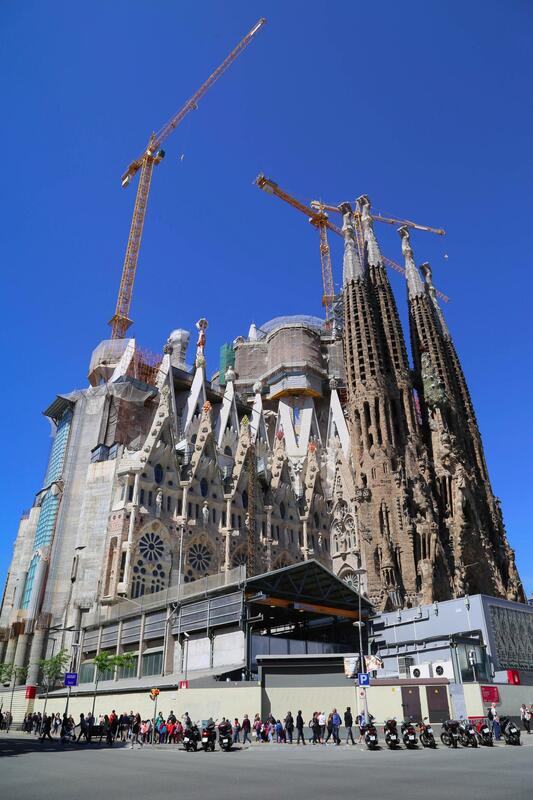 While modern methods are used to complete the task of building Sagrada Familia to Gaudi’s specifications, there are no shortcuts. 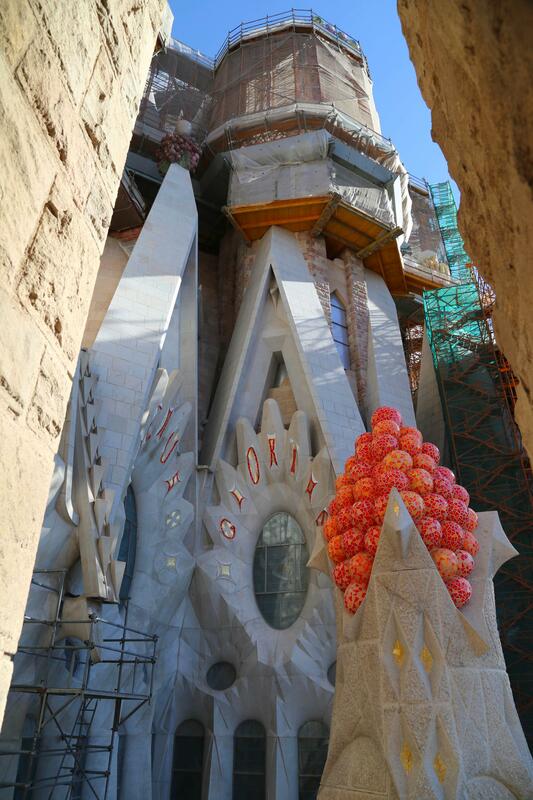 The tile work on this accent piece demonstrates the great care being taken to adhere to Gaudi’s design. 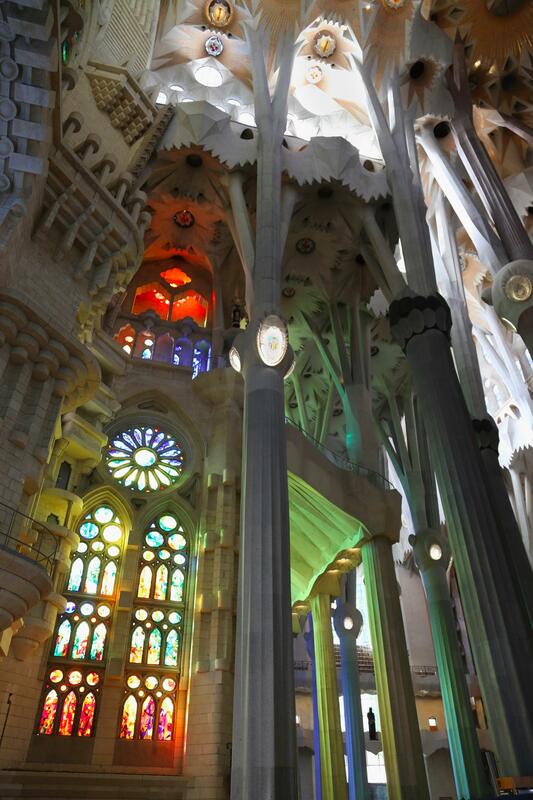 Antoni Gaudi was passionate about his Catholic faith. Every day he went to mass as well as confession. 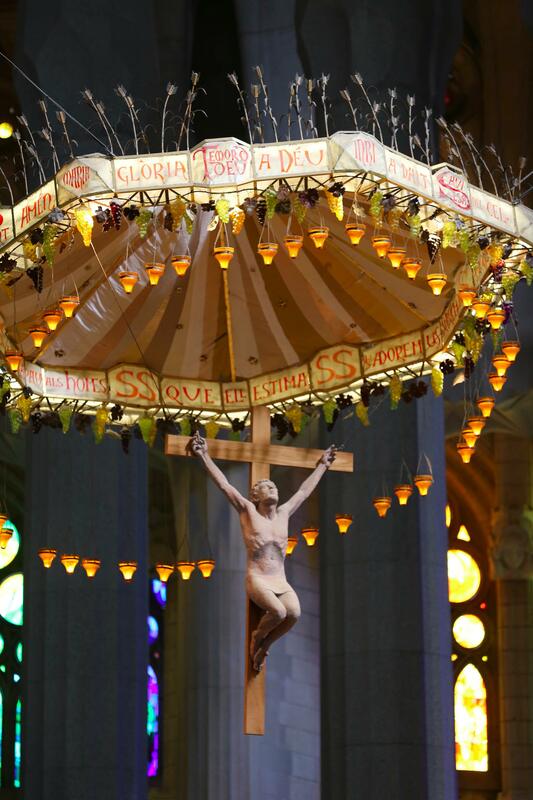 This crucifix hangs above the altar at Sagrada Familia. 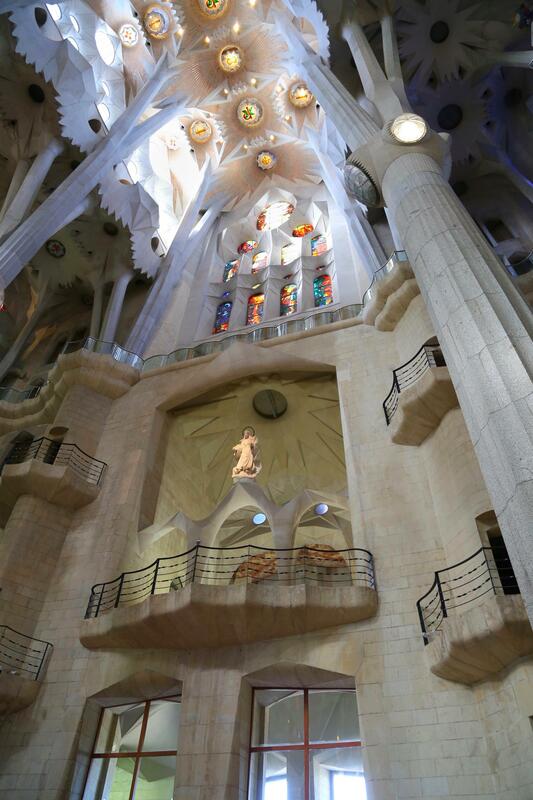 The gigantic volume of the interior of Sagrada Familia creates a wonderful perspective for visitors to reflect on the immensity of faith. 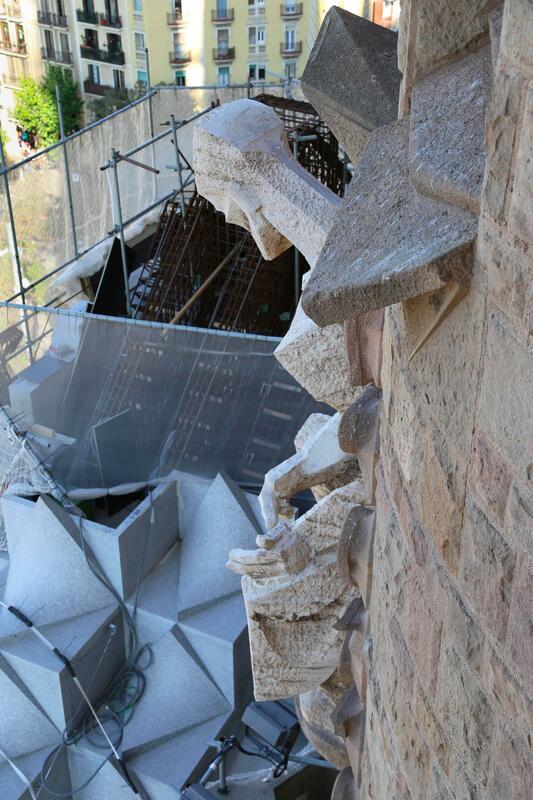 When Gaudi died in 1926, this view of Sagrada Familia would not be completed for many decades. Everywhere you look inside the basilica one sees spiritual devotion and adoration. 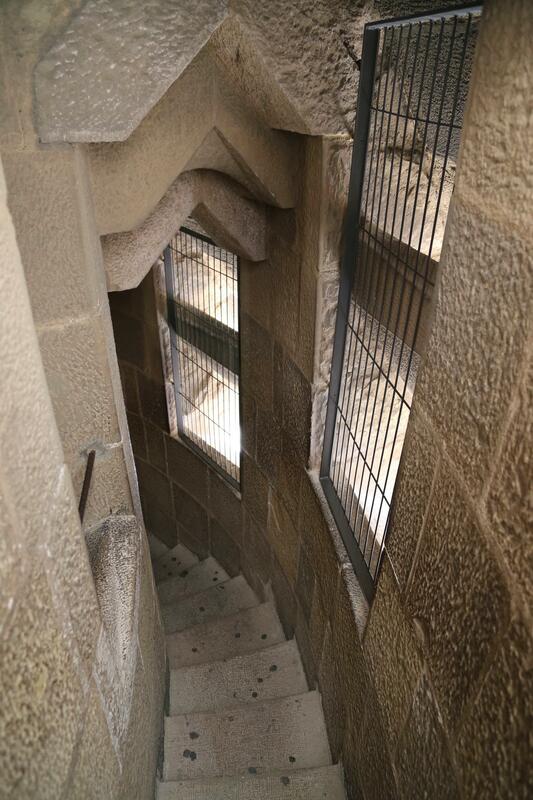 A visit to Sagrada Familia offers stunning views at nearly every turn and is testament to the great care and attention Gaudi designed, even something as simple as an iron railing. 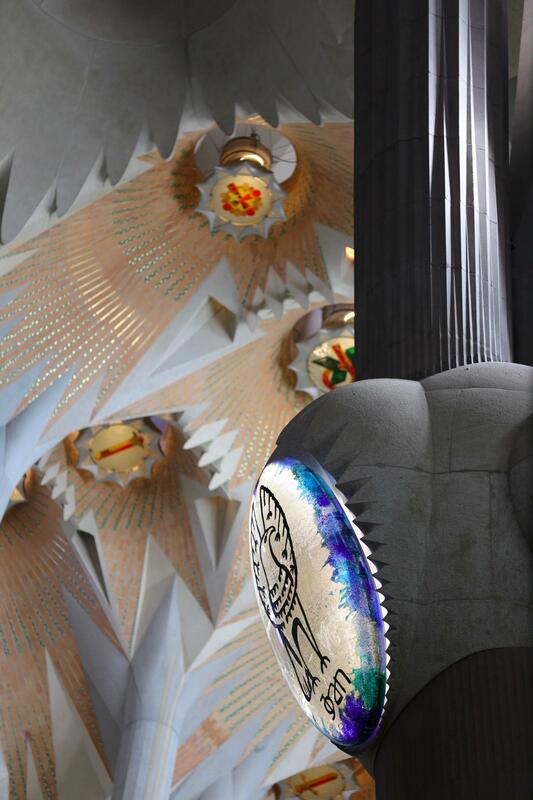 Antoni Gaudi died more than 90 years ago, but the designs and plans he created for Sagrada Familia, like complex multifurcation of the interior columns, are being followed by the current team of designers and builders. 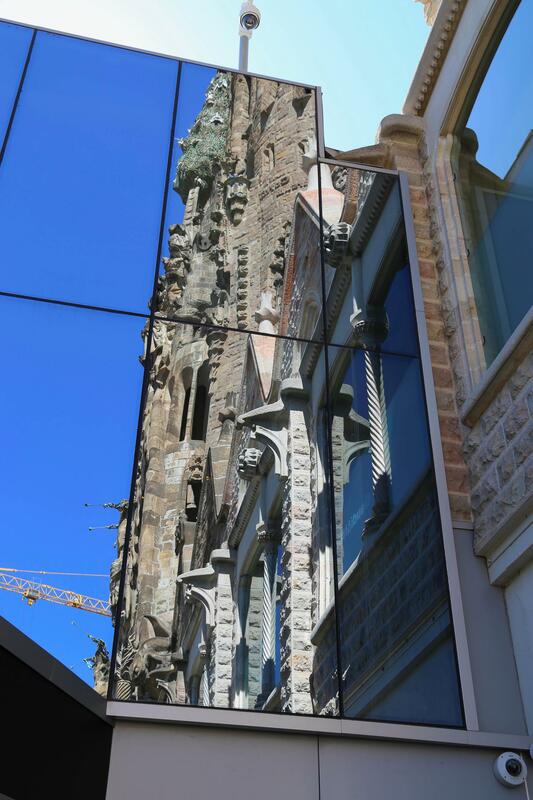 Sagrada Familia combines and reflects brilliant engineering, a reverence of nature and a sense of design that results in one of the most beautiful churches in the world.